The worst part about finding a series that you really love is knowing that someday it will end. That was my dilemma with If I Should Die. It was hard to turn each page knowing that I was that much closer to saying goodbye to Kate and Vincent. At least I could console myself with an awesome book. Until I Die left us hanging onto the edge of a cliff for dear life. If I Should Die doesn't waste time with back-story. Instead, the first few pages pushes us right off that cliff into a terrifying free fall. The obstacles separating Kate and Vincent seem irreparable...but are they? It's hard to go too much into the plot of If I Should Die, because everything would be a spoiler. Suffice it to say that the characters encounter one problem after another. I spent hours glued to my iPhone sitting on the couch, because I just had to know what was going to happen. I loved the direction the plot took. I guessed the basic details pretty early on in the book. While it's nice to be surprised, it's just as good or even better to see a story unfold exactly the way you want it to. If I Should Die delves deeply into revenant history and makes these altruistic zombies feel even more mystical. One of my favorite things about this series is the originality of the paranormal creatures. It's refreshing to read about something other than vampires, angels, witches, or zombies (well, traditional bad zombies). The revenants have a rich backstory and Amy presents in a manner that makes it easy to forget that they're not real. I'm devastated to say goodbye to Kate, Vincent, Jules, Ambrose, Charlotte, Charles, Gaspard, Jean Baptiste, Jeanne, Arthur, Genevieve, Bran, Georgia, Mamie, and Papy. The Revenants series has a huge cast of characters. I've come to know and love all of them. I would love for Amy to continue writing in the revenant world. There are so many things I still want to know. I can see good options for a spin-off or even more books from Kate's perspective. I really don't want this to be the end. 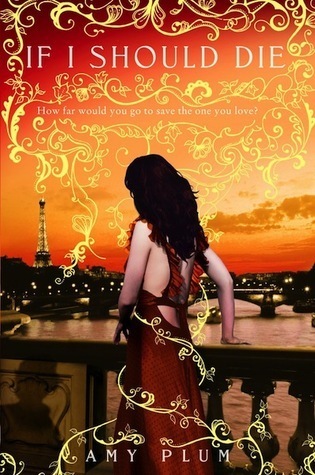 If I Should Die finishes the Revenants series at a high point. Amy captured my heart with Die For Me. Until I Die was a good continuation, but If I Should Die stands alongside Die For Me on my rare multiple re-read shelf. I really can't recommend If I Should Die and the whole Revenants series highly enough. I have high hopes for this book, more so with the ending cause I want a happy ending for everyone. Can't wait to read it now. Great review! I need to read the second and third book of this series! I was waiting until book 3 came out, because i heard about the cliffhanger of book two. But I'm kind of nervous because I liked the first book so much. I should just bite the bullet and dig in. Ahhhhh I'm equal parts nervous and excited for this book Alison! My heart about fell out of my chest at the end of the last one, so I definitely want to see that situation remedied, but I know things are likely to get worse before they get better. So glad we get lots of revenant history though, can't wait for that! I need to get caught up because I loved the first, and this sounds like an amazing ending. YAY! Wasn't it just awesome! I totally loved the way it ended. Thanks for sharing your review. Okay you SO have me wanting to read the first book RIGHT NOW! I've had it since it came out and even met Amy and I STILL haven't read it! I'm going to though, really, really soon! Wow, I'm kind of surprised at this. I had gotten the impression from a few reviews that Die For Me was a poor read so I had kind of written this whole series off, I'm afraid. But now I'm thinking I should change my mind if you think so highly of it! I'm loving that this has a unique paranormal being. I've read the first book, but haven't read the rest. I'm definitely wanting to even more now!